This week (er, recently), Drake gives a once over to three of the most anticipated releases of the year. Look out Polaris Prize, I think we’ll be seeing some of these Canadian LPs on the short list. -ed. This week’s boon of great releases should’ve proven an inspiration for penning this weekly post, but Rhapsody picked the worst possible time to do a database overhaul. No albums entered into the system for over a week. New releases from Broken Social Scene, The Hold Steady, The New Pornographers, Josh Ritter and Minus the Bear headline the week. I really don’t know how to feel about The Hold Steady’s fifth album, Heaven is Whenever. Nearly all the elements are there, Craig Finn and his whip-smart talk-singing and Tab Kubler’s fretwork, but it all feels kind of lifeless. Yes, Franz Nicolay’s piano flourishes are definitely missed, but there’s also just feeling of treading water here. Finn has said in interviews that this is the first album where they didn’t treat it like it might be their last, that they finally feel like they’re going to be around awhile and it loosened things up in the studio, so maybe that’s the reason for Heaven‘s lack of urgency. 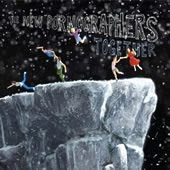 It could be said that the New Pornographers, both collectively and separately, have been in a minor slump of sorts. The last full length releases from A.C. Newman, Dan Bejar’s Destroyer, Neko Case and even the collective themselves were all not nearly as great as prior releases. I mean, that’s not really being critical as the albums weren’t bad, but across the line, there was a dip in quality. So it’s refreshing that Together bucks that downward trend, even if its still below the bar that they’d set in the first three releases. The opening track, “Move,” does its best to fool me into thinking it’s an homage to the great UK band The Move, with its crunchy cello opening, and the following track, lead single “Crash Years,” is a high mark for the band. Dan Behar is even contributing songs that sound like they’re part of the action (“Silver Jenny Dollar” and “If You Can’t See My Mirrors”), instead of sounding like their shoehorned into the proceedings. A database issue cut this list short… so I filled in some of the blanks -ed. Terror Pigeon Dance Revolt – I Love You. I Love You and I’m in Love with You. Have an Awesome Day! Have The Best Day Of Your Life.